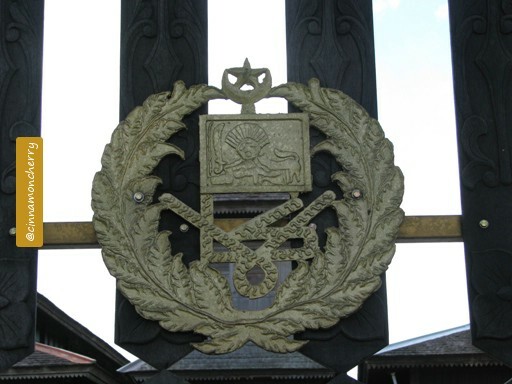 Pangkalan Bun is derived from Pongkalan Bu'un. Bu'un was the name of a Dayak helper who was very loyal to Kutaringin's king. Various legends and tales are told and retold to younger generations, and they are all very fascinating. 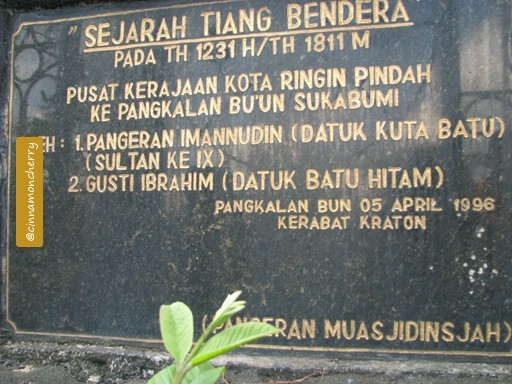 Kutaringin's founder was Pangeran Adipati Antakesuma. He was one of the princes in Banjar kingdom. It is said that he'd like to rule on his own, so her brothers let him find his own domain. 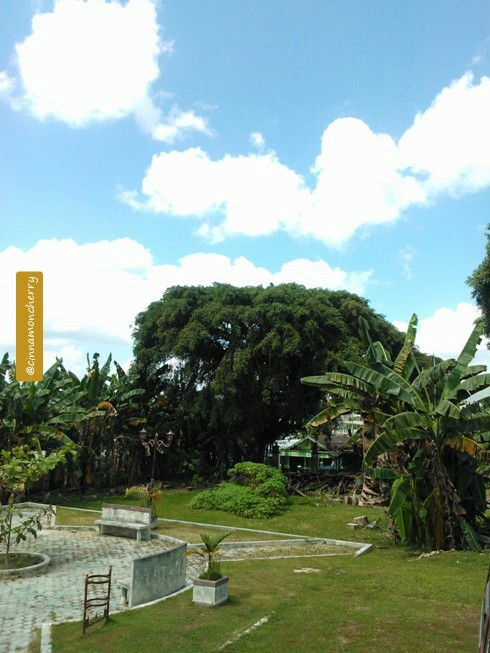 A legend states that after journeying for a while, he stumbled upon rows of banyan (beringin) tree, thus he named his kingdom Kutaringin. 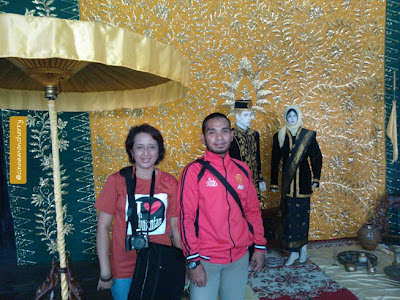 We were lucky enough to be able to visit Istana Kuning. It was made of ulin (ironwood). Unfortunately, the real palace burned down many years ago. The local government rebuilt the palace, however they did not really listen to the descendants of this kingdom, thus some parts did not resemble the palace in the past. I found it very sad since many parts of the palace, like the courtyard where the king addressed his people, and secret tunnel leading to a nearby banyan tree, were no more. Here you can see the banyan tree, if my memory serves me right, the secret tunnel from the palace should lead to this place. So that whenever danger was present, the royal family could escape, safe and sound, protecting their lineage. 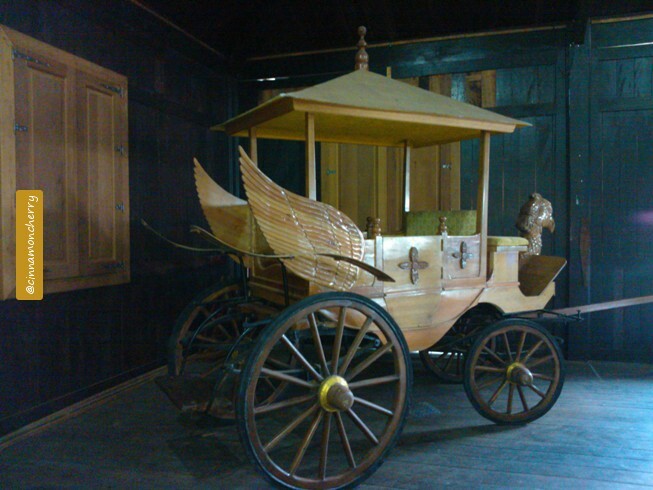 This is a replica of royal Kutaringin horse carriage. It is said that on certain times, some people might see a beautiful lady on this carriage. With traditional clothes and all, perhaps a lady from the past? Spooky, eh? I did not see anything during my visit, thankfully. The original one was destroyed during the fire that I mentioned earlier. Too bad. 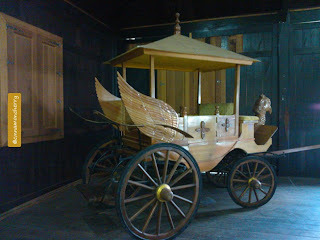 Still, the replica will give you quite an insight about what the lords and ladies of Kutaringin used back then as a mode of transportation. And here you can see replica of gamelan, traditional music, in Kutaringin. They really use a lot of yellow color, yellow denoting the royal family. I'd love to play it but it seemed disrespectful somehow. 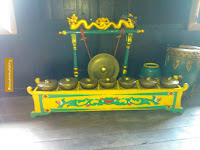 Maybe one day, when a festival is held, you will be able to see a similar gamelan being played for the audience. Here you can see yours truly with James, one of the guides. He is one of the royal descendants. As royal descendants, they have a title called "Gusti". However they prefer to be called with their nicknames, since if you call out "Gusti", some people are bound to look at you and ask, "Which Gusti did you mean?" In the background you can see the replica of what the king and queen might wear in the court back then. Here you can see James with the founder of Kutaringin. He told me that in order to paint the kings of Kutaringin (no pictures of them are available, thus the painter would have to paint from special "sights" bestowed to him/her), the painters have to undergo a special ritual, asking for blessings and permissions. If they refuse to do so, they will encounter misfortunes. One painter, I've been told, had internal bleeding when trying to paint without completing the ritual. This might sound strange to you, but I've heard and seen stranger things, so I believe the story. James assured me that it was fine to take pictures, providing you had no evil intention. He told me that some time ago, a tourist took so many pictures of the paintings but none of the kings' faces could be seen. Perhaps the tourist had an evil intention? I asked, jokingly. James replied solemnly that the answer could be that, or, perhaps the ancestors did not take a liking to the tourist. Who knows! The guides (James is one of them) have their shares of curious tales. 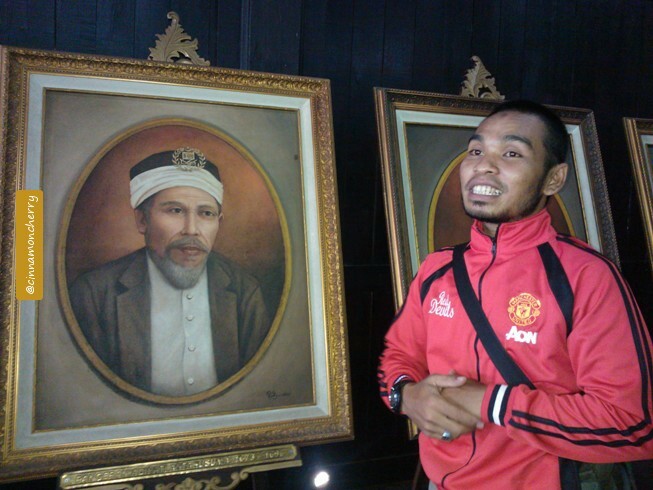 Whenever you are in Istana Kuning, feel free to ask them about the stories... and be entertained! 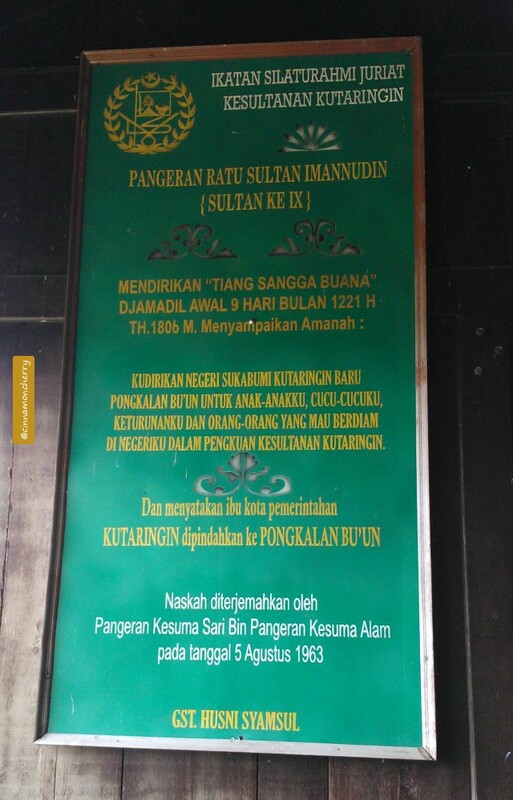 (or spooked, if you get scared easily) Make sure to ask about the legends, the stories concerning the palace, and how Pangkalan Bun continues to remain safe and sound after all these years. 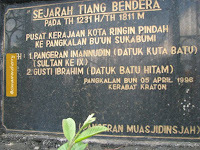 And here you can see the monument of a piece of ulin/ironwood branch being put here by a sultan/king of Kutaringin. I won't share the picture of the ironwood here. 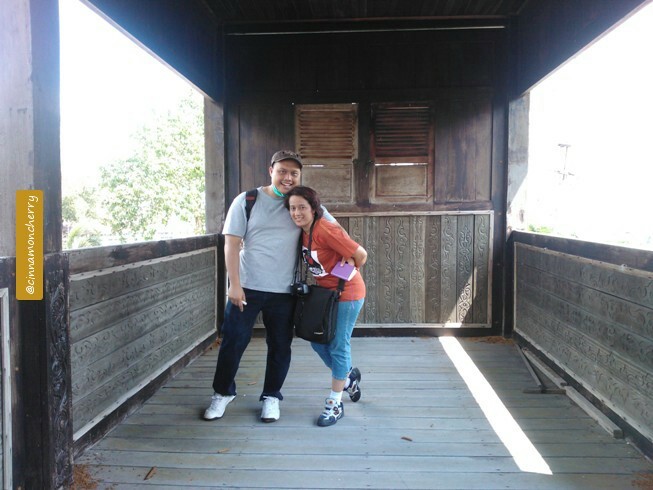 Just visit Pangkalan Bun and see for yourself, and you can marvel at how a 200-year-old piece of wood continues to remain strong and majestic! Yours truly and my partner, posing in second-story of the new palace. Like the old palace, the new one was made of ironwood as well. I am at loss on how I should call this. Treatise? Decree? Will? This is a translated version and definitely not the original one. However, reading this still gives me goosebumps. There's something sacred and powerful from these words. It's like a promise. A powerful pact. And I feel honored that I was able to visit this place, seeing those things with my own very eyes. 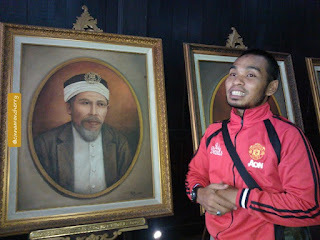 It makes me proud that Indonesia has so many cultures and languages and traditions. Hopefully, one day, I will be able to visit again. 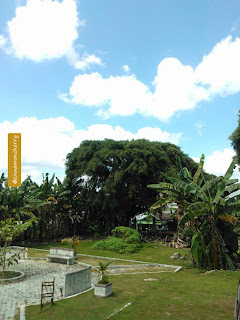 Enak betul jalan-jalan di Indonesia, banyak tempat untuk lihat. 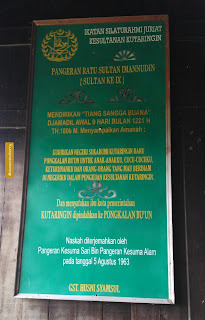 Benar sekali. :) Salam kenal juga. Have a good day!